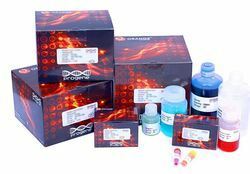 Pioneers in the industry, we offer sandwich elisa teaching kit, dot elisa teaching kit, competitive elisa teaching kit, antigen capture elisa teaching kit and antibody capture elisa teaching kit from India. The Sandwich ELISA measures the amount of antigen between two layers of antibodies (i.e. capture and detection antibody). The antigen to be measured must contain at least two antigenic sites capable of binding to antibody, since at least two antibodies act in the sandwich.Either monoclonal or polyclonal antibodies can be used as the capture and detection antibodies in Sandwich ELISA systems. Monoclonal antibodies recognize a single epitope that allows fine detection and quantification of small differences in antigen. A polyclonal is often used as the capture antibody to pull down as much of the antigen as possible. In Dot ELISA,the antigen is sandwiched directly between two antibodies which react with two different epitopes on the same antigen. Antigen in the test sample first reacts with the immobilized antibody and then with the enzyme-linked secondary antibody. The amount of enzyme linked antibody bound is assayed by incubating the strip with an appropriate chromogenic substrate, which is converted to a coloured, insoluble product. The latter precipitates onto the strip in the area of enzyme activity, hence the name Dot-ELISA. The enzyme activity is indicated by intensity of the spot, which is directly proportional to the antigen concentration. In this technique, antibody is first incubated in solution with a sample containing antigen. The antigen-antibody mixture is then added to an antigen coated microtiter well. The more antigen present in the sample, the less free antibody will be available to bind to the antigen-coated well. Addition of an enzyme-conjugated secondary antibody (Ab2) specific for the isotype of the primary antibody can be used to determine the amount of primary antibody bound to the well as in an indirect ELISA. In the competitive assay, however, the higher the concentration of antigen in the original sample, the lower the absorbance. Antigen capture ELISA method is the most useful Immunosorbent assay for detecting antigen, since it is 2-5 folds more sensitive than those assay in which antigen is directly bound onto the solid phase. To utilize this assay, one antibody (the "capture" antibody) is purified and bound to a solid phase.Antigen is then added and allowed to complex with the bound antibody. Unbound products are then removed with a wash, and a labeled second antibody (the "detection" antibody) is allowed to bind to the antigen, thus completing the "sandwich". The assay is then quantitated by measuring the amount of labeled second antibody bound to the matrix, through the use of a colorimetric substrate. Antibody capture ELISA is a sophisticated, complex test that has proved useful in the diagnosis of many infectious diseases (e.g. rubella, measles, and toxoplasmosis). Antibody capture ELISA are particularly sensitive in demonstrating IgM responses early in illness. Reasons for this increase in sensitivity are: specific antibody isotypes in the patient's specimen are bound to the solid phase by the capture antibody allowing the specific antibody-antigen reaction to occur in the absence of competing isotypes; soluble antigen is added in excess (allowing the antigen and antibody to react in antigen excess); and the antibody capture ELISA measures the proportion of specific to total antibody of a given isotype (which may be detectable earlier than simply measuring specific antibodies as in an ELISA test). Looking for Elisa Teaching KIts ?